While terrorism prosecutions involving extremists affiliated with ISIS grab the headlines, international terrorists make up only a small proportion of all terrorism prosecutions that take place each year in the United States. The latest available data from the Justice Department show that during the first eleven months of FY 2017 the government reported 166 terrorism-related prosecutions had been filed. Of these 38, or less than one in four (22.9%), were classified as international terrorism. Even through defendants born in the United States are counted as international terrorists when they act in support of a foreign terrorist organization, there are still many more cases of domestic as compared with international terrorism prosecuted each year. So far during FY 2017, for example, there have been 61 domestic terrorism prosecutions. Over the last five years government documents recorded 404 prosecutions for domestic terrorism as compared with just 223 for international terrorism. The U.S. Justice Department also includes other offenses under its broad category of terrorism- related prosecutions. These additional cases concern offenses that compromise critical infrastructure protection, terrorism-related financing, terrorism-related export enforcement, as well as terrorism hoaxes. 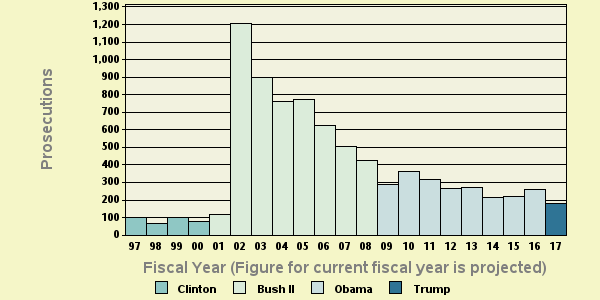 Table 1 provides a breakdown of federal terrorism prosecutions that includes national internal security cases by type during each of the past five fiscal years. The Federal Bureau of Investigation is the lead investigative agency in most cases. So far during FY 2017 in three out of four terrorism prosecutions, or 125, the FBI played the lead role. The remainder of cases were the result of investigations led by a range of other agencies. During the current year these included the Secret Service in the Department of Homeland Security with eight; Alcohol, Tobacco, Firearms and Explosives in the Justice Department with seven; and Immigration and Customs Enforcement in Homeland Security with six. Terrorism prosecutions fell significantly this past year. With 166 prosecutions during the first eleven months of FY 2017, the annual total is projected to reach 181 if the same pace of prosecutions continues. According to the case-by-case information analyzed by the Transactional Records Access Clearinghouse (TRAC), this estimate is down 30.1 percent over FY 2016 when the number of prosecutions totaled 259. See Table 2. Prosecutions over the past year are also much lower than they were ten years ago. Overall, the data show that prosecutions of this type are down 64.2 percent from the level of 505 reported in 2007. The comparisons of the number of defendants charged with terrorism and national internal security offenses are based on case-by-case information obtained by TRAC under the Freedom of Information Act from the Executive Office for United States Attorneys. The long term trend in prosecutions for these matters going back to FY 1997 is shown more clearly in Figure 1. Prosecutions peaked during FY 2002 in the aftermath of the September 2011 attacks. The vertical bars in Figure 1 represent the number recorded each fiscal year. Projected figures for the current fiscal year are shown. Each presidential administration is distinguished by the color of the bars. Table 3 shows the top lead charges recorded in the prosecutions of terrorism matters filed in U.S. District Court during the first eleven months of FY 2017. Leading the list of charges is providing material support to a foreign terrorist organization under Title 18 Section 2339B of the U.S. Code. During FY 2016 it was the second most frequent charge, while five years ago it ranked only in sixth place. Ranked second in frequency were offenses for the illegal importation and storage of explosives under 18 U.S.C. 844, while in third place was prosecutions involving interstate communications - an offense under 18 U.S.C. 875. Among the top ten lead charges, the one showing the sharpest projected decline in prosecutions compared to one year ago-down 59 percent-was "Harboring or Concealing Terrorists " (Title 18 U.S.C Section 2339 ). This was the same statute that also had the largest decrease when compared with five years ago. The Southern District of Florida (Miami) with 20 prosecutions has been the most active during FY 2017. The District of Washington, D.C. ranked second with 14 prosecutions, followed by the Northern District of Oklahoma (Tulsa) and the Eastern District of Virginia (Alexandria) tied for third place with eight prosecutions each. There is considerable year-to-year variation as to where terrorism prosecutions take place. During FY 2016 the District of Oregon led the list with 37 terrorism defendants prosecuted, followed by the Southern District of Florida with 32, and Nevada with 24.